I got a lost on the way to meet a couple friends for lunch yesterday (long story), so by the time I finally arrived, the appetizers were already being placed on the table. This restaurant offers up a variety of vegetable appetizers, and they selected a few simple ones--broccoli, cauliflower, and green beans--each prepared in a different way. It was the kind of thing I probably wouldn't have thought to order myself, which I loved, because it reminded me just how impressive good, in-season vegetables can be when prepared well. At home, I've been doing things with vegetables a lot lately. It always happens around this time. After months of cold, dreary weather and not much in terms of seasonal offerings, the burst of Spring warmth gets me excited to be back in the kitchen. 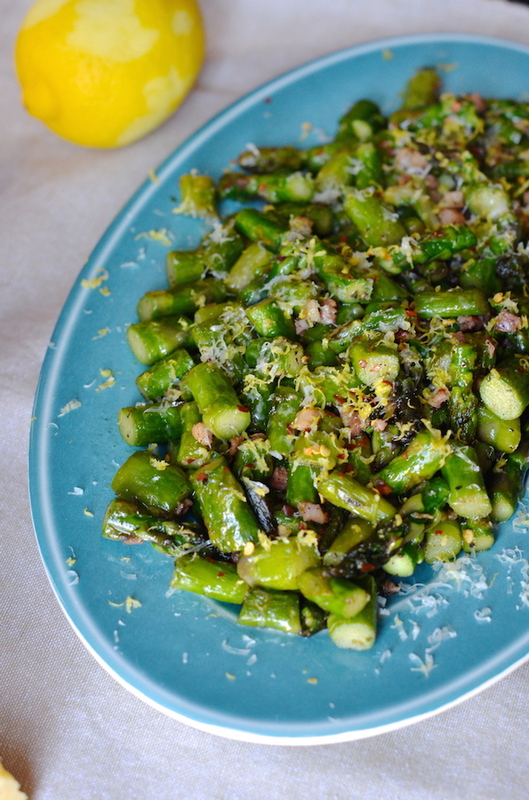 Asparagus, chopped into small-ish pieces, and sauteed with pancetta, garlic and chilies is a new favorite of mine. I cook them briefly--just until a bit tender, then scoop onto a platter and shower with fresh lemon zest and freshly grated parmesan cheese. I love this on its own as a side, or topped with a fried egg or two for breakfast (or any meal, actually). You can also toss this with cooked pasta or rice for an easy veggie entree. Simple, yet satisfying, because that's what Spring cooking is all about! 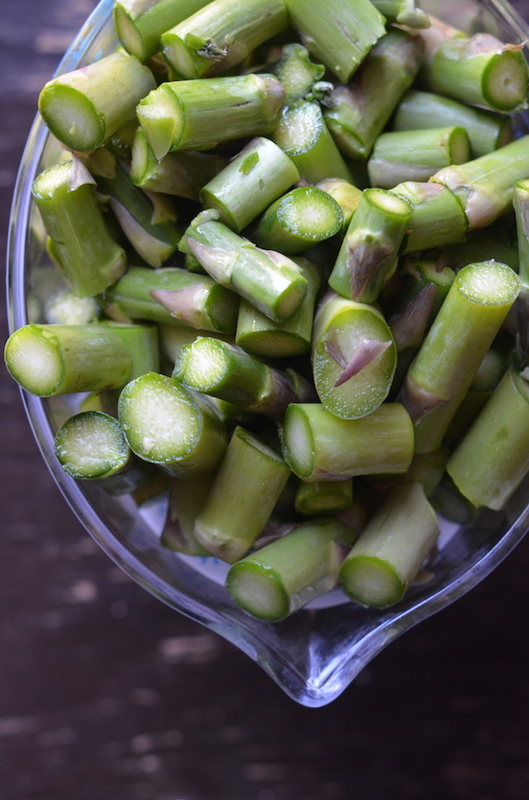 Trim the woody ends off the asparagus, then chop what remains into about 1" pieces. In a heavy-bottom pan over medium-high heat, cook the pancetta or bacon until the fat is rendered. Add the garlic and saute for one minute until fragrant. Raise the heat and add the asparagus pieces and red pepper flakes. Season with salt and pepper, and saute for about 5 minutes or until pieces are slightly tender, but still bright green. Serve on a large platter, then sprinkle with the fresh lemon zest and parmesan. Sprinkle with a few additional chile flakes before serving.